CLUB LIFE IN TEANECK NEW YEARS EVE NYE PARTY– LIFE NEW YEARS NJ- HOTTEST NJ'S NYE PARTY WITH THE HOTTEST DJS! 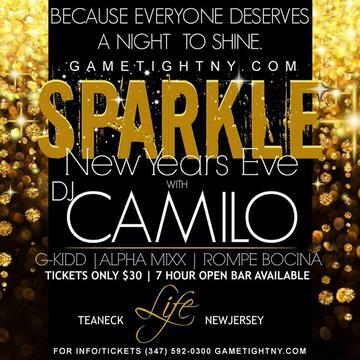 LIFE NEW JERSEY NYE NEW YEARS EVE WITH MUSIC BY NYC HOTTEST DJS WITH HOT97 DJ CAMILO, DJ GKIDD, ALPHA MIXX, ROMPE BOCINA! LIFE NIGHTCLUB IN TEANECK NEWJERSEY NJ NEW YEARS EVE NYE TEANECK PARTY! TICKET EVENT 21 & OVER! LIFE LOUNGE NJ NEW YEARS EVE NYE PARTY! CLUB LIFE IN TEANECK, NJ! CAPACITY EXPECTED! BUY YOUR TICKETS NOW FOR JUST 30$! ADMISSION TICKET $30 IN ADVANCE INCLUDES: ADMISSION TO THE VENUE, FREE PARTY FAVORS, CHAMPAGNE TOAST, LIVE BALL DROP VIEWING! ADMISSION TICKET $99 IN ADVANCE INCLUDES: 7 HOUR TOP SHELF/PREMIUM OPENBAR, ADMISSION TO THE VENUE, FREE PARTY FAVORS, CHAMPAGNE TOAST, LIVE BALL DROP VIEWING! Life in Teaneck NJ New Years Eve Dress Code: Formal attire highly recommended but not required! RECAP OF LAST YEAR AT LIFE NEW YEARS EVE NYE NJ!